Am I posting the right photos? Am I writing the right thing? Am I expressing myself accurately...the way I see things and really feel? Well, I was going through Max's photos tonight and found that there's a few others from the last session that should be shared. This was shortly after Max woke up. I just love that both Andy and Melis are in the shot with Max. Just a gentle moment captured. 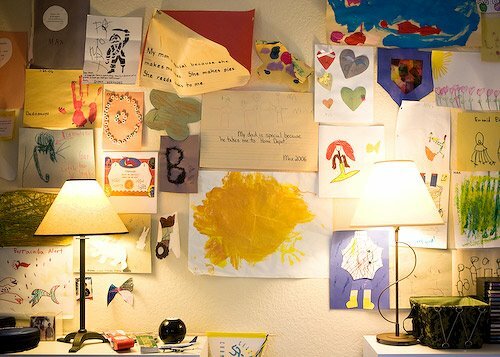 And a shot of the playroom walls. One of the first things I saw was something that Max wrote, My dad is special because he takes me to Home Depot. I commented on how cute that was and Andy laughed a bit, shrugged his shoulders and said, Well, I don't know. And then Melis chimed in and shared that hers is even better. It said, My mom is special because she makes me cakes. She makes pies. She reads books to me. Then she shared that she's not much of a baker at all. I couldn't help but giggle. But the one thing I want to share and get across is...there is so much love in the Mikulak house. And Max's medicine. I asked Andy about Max's medicine and he took me to the kitchen. 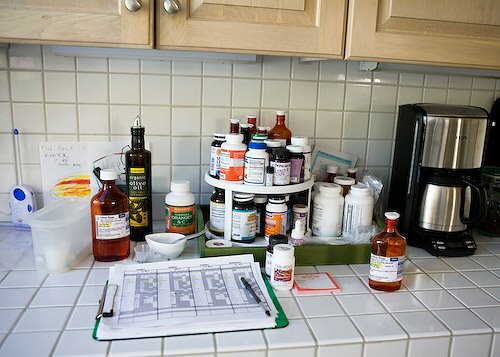 I anticipated that I would see quite a bunch of medicine but seeing them all sitting there on the kitchen counter...well, I was a bit shocked. Remember...this is not a ill geriatric patient taking all these medicines; this is a little 6-year-old boy. You can also see the schedule there, to keep track of what is due when and what was given when. And there's more. In the kitchen pantry are shelves of additional medicine, nutritional supplements (for his g-tube feedings) and medical supplies. I just found this blog and would like the Makulaks to know that I am praying for Max and for strength for the whole family. I have a 2 year old daughter and can't imagine how hard it must be to have a sick child. Max seems to handle it with grace. Again, prayers going up for Max!